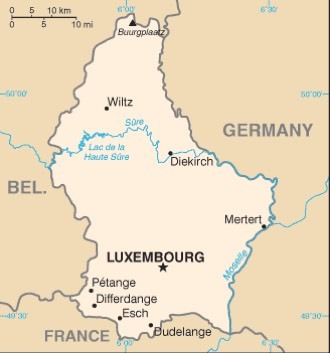 Luxembourg : When and where to go? The climate is semi-continental, with a sunny summer without heat, a cold winter and a wet autumn. The best period for a discovery of the country is between May and September. Luxembourg is the capital of the country: a contrasting and successful mixture of past architecture and contemporary buildings, it offers the traveler its animation and cultural dynamism, with a large number of museums, theaters and concert halls. Very strongly marked by its multicultural dimension (150 nationalities are there), it draws its vivacity in its roots, and its old city is inscribed in the patrimony of the UNESCO. In addition, its tourist sites are dotted with green spaces and gardens that make its discovery even more pleasant. You will visit the Place d'Armes, Place Guillaume II, the Cathedral, the Grand Ducal Palace, the National Museum of History and Art, the Corniche Road, among others. Further to the north, the Mullerthal region, also known as the Petite Suisse Luxembourgeoise, offers hilly landscapes enamelled with rock formations. Its most important city, Echternach, which is also the oldest in the country, is famous for its Dancing Procession, combining dance and prayer and gathering thousands of pilgrims. You can also visit the Roman Villa, the cultural center of Trifolion or the Benedictine abbey of Saint Willibrord. But it is also an ideal area for hikers, with its 112 km of hiking trails in sumptuous landscapes. To the northwest you will find the natural park of Haute-Sûre. It is characterized by its immense reservoir lake, which allows an offer of diverse leisure activities in a very pleasant landscape. In the southern part of the country, the Redlands region is so named because of the color of the mineral used in the country's iron and steel industry. It now includes most of the commercial cities like Differdange, Dudelange, Esch-sur-Alzette, very modern and dynamic: they offer various festivals, concert halls, street theater, and soon a university will open its doors . You can also explore the Parc Merveilleux in Bettembourg, which will delight children. All you need is a valid ID to enter Luxembourg. There are flights from Paris which make you land at Findel airport, 6 km from the capital. You can also take the TGV from Paris which takes you in 2H10 in Luxembourg. To move around the country, there is a very good bus network in the capital, but also in the direction of neighboring cities. For those who prefer the car, know that the roads are excellent. Budget: prices are rather high, unless you opt for cheap hostels and restaurants. Otherwise, you can pay around 50 € per night for one person and 25 € for a meal in the restaurant. Health: No specific health problems. Security: Security is the same as in most European countries. Shopping: You will find all the famous brands in the pedestrian areas of the capital, but also in the superb shopping centers, and you will find bargains in the markets and braderies that take place in most towns and villages and are also Places where to buy local products.